I found this little tracked robot platform at mutr.co.uk. It's quite difficult to find tracked robot platforms (or even the components) cheaply, but this is very nice for the ~ ten pounds they charge. It contains the tracks, wheels, motors and gearboxes, an aluminium plate for the chassis, fixing screws and some three-way switches and wire. It needs a bit more than just assembly to get it moving - I had to fold and drill the aluminium and glue some of the wheels together, and I found the motor tended to rise out of the gearbox if I didn't tie it down with some copper wire. Somewhere I have some infra-red proximity sensors and a camera board I'd like to attach to it to make it into a proper robot. It'll need a suitable battery and some motor controllers - the Electronize controllers I have at the moment are a bit too big for it. MUTR sell a lot of useful stuff - I got some Nitinol memory wire at the same time, which is very interesting stuff. Their £5.80 default delivery charge is a bit annoying for small orders, but handily I have some colleagues who also buy from there to share costs with. 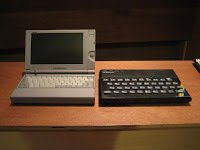 The ZX Spectrum laptop is a combination of two old computers: a ZX Spectrum 48k and a Toshiba Libretto 110. The Spectrum is an iconic British computer from the 1980s, selling in huge volumes (although I was brought up on a BBC Micro myself), and the Libretto was one of the first truly tiny x86 laptops, quite amazing when it appeared about a decade ago. The modification keeps the case and keyboard of the Spectrum and the main circuit board and display unit from the Libretto. Connecting the keyboard was by far the most difficult part. I went through several ideas to try and figure this one out. The PS/2 port would be an obvious choice, but the Libretto only has a PS/2 connector on the docking station attachment, which was too bulky to fit into the Spectrum case. It’s the same story for the serial and parallel port. 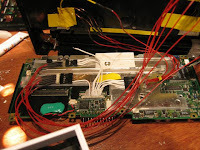 The only standard communication options on the mainboard are the PCMCIA slots and the IrDA port, and I wanted to keep the IrDA port free for other communications. So the next idea was to try and replace the Libretto’s keyboard more directly. Luckily, the Libretto’s keyboard unit contained no active electronics and was just a matrix of contacts on a plastic membrane. 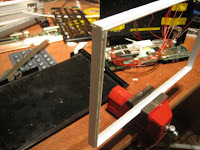 Logically then it is possible to simulate the keyboard by shorting various lines at the point they connect to the motherboard. However, the Libretto’s keyboard connects to its main board by a 0.8mm pitch flexible circuit connector, which is rather difficult to connect to. I tried several attempts to connect flying leads to the membrane, using glue and silver paint, which were mildly successful. The two keyboards are logically just arrays of switches with row and column connectons coming out, although the Libretto obviously has more switches, having an 8×13 matrix compared to the Spectrum’s 5×8. The challenge then was to pick out the particular rows and columns to use on the Libretto so that each key on the Spectrum made a valid keypress - some row/column combinations might have been ‘blind’ for the Libretto, for all I knew. I traced the keys to rows and columns on the Lib - mainly using digital photos of the membrane and a flood fill tool. Meanwhile, the physical construction provided some more challenges. I had to cut away quite a lot of the case to fit in the display, and getting the display straight and closing nicely was quite fiddly. The case also had to be made a bit deeper to fit in the battery, so I made up a frame to separate the top and bottom halves of the Spectrum case. Having done that I could switch on the Libretto and make a few keypresses on the Spectrum keyboard - nothing very sensible since mapping a letter to the correct one would have been impossible. Before I got very far, though, I realised the connections to the membrane were unreliable and decided to solder directly to the Toshiba’s motherboard. This is a very tricky task with the 0.8mm pitch, and I didn’t get all the connectors but I did manage to get the 5 columns and 8 rows I needed. The result isn’t very pretty, but did look a lot nicer than the rat’s nest made by the membrane keyboard and glue mess. The Spectrum keyboard remains connected by glue and paint, although it was easier to make a robust connection to the wider membrane on its keyboard. With those all attached reliably, I made up a new keymap for linux so the keys would map correctly, and could actually type properly on the Spectrum keyboard. Getting Debian onto the Libretto was the next challenge. The PCMCIA-attached CD ROM drive that came with it had packed up, and the floppy drive is a nonstandard type that won’t work for Linux installations. There isn’t an ethernet port, even on the dock, so the best option was to make up a bootstrap image on the Lib’s hard disc, return it to the Libretto and boot it from there. This seems to have worked fairly well. The remaining problem, which I haven’t figured out yet, is how to get some communications so I can download and install new software without resorting to the dock (I have to take the mainboard out of the case to fit it in the dock, so it’s not very desirable.) The PCMCIA ports would seem the best option, but I haven’t been able to bring up an ethernet card in it yet. The IrDA port is also a possiblity, although downloading any data through that might require quite a lot of patience. So, what use is it? Well, the obvious application would be to load up a ZX Spectrum emulator to have a portable retro games system. It’d also be good for making notes while on the road - the batteries are good for a couple of hours, which surprised me considering they’re ten years old. Otherwise it’s just a bit of an objet d’art. I've not had much to post about recently, due to a rush at work, not being able to get to Newark Kit Car show, and being on holiday. I'm working flat out on a little retro computer project at the moment, which I'll detail later, but for the moment I'll just post this picture of a method I'm experimenting with to attach flying leads to flexible circuits. A few days ago at work we got some new computers in and decided to call one of them 'Theremin' since all the others were named after instruments and we were running out of ideas. A quick browse later and I found Art Harrison's web site on Theremins. This is built from his '2006 Minimum Theremin' instructions and I found it pretty easy to find all the components at Maplin. It's a simple design, meant more for demonstrations and science fairs than musical use - Art has designs for more sophisticated theremins on his site. I've no doubt reduced its musical quality by deviating from his design, but you can still get a tune out of it. I've left off the tone control - it's an preset on the board rather than a proper control - but you can alter the range quite adequately by adjusting the length of the telescopic antenna. Last weekend my friend Dan invited us all down for a barbeque. 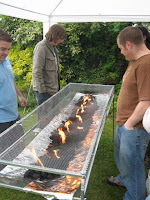 A generous offer anyway, but this had the added highlight that Dan had built the barbeque from scratch. It's a fine piece of engineering - perhaps not quite as stable as a brick barbeque but it served very well and cooked plenty of food for fifteen or so hungry guests over the weekend. The construction materials are (so far as I remember) 1/2" steel bar and angle, some thin steel plate, steel mesh and those corner strips plasterers use - the closest thing most DIY stores will have to perforated angle. If anyone else has a go at this, my one piece of advice would be to avoid galvanised metal, as can give off some nasty fumes if heated. Compared to the quantities of ethanol usually drunk at barbeques though, it's probably a drop the ocean. Dan also made a giant jenga set by cutting up some planed timber - a very quick and effective party piece. Pictures of that are in the gallery. EvilMadScientist's sugar fabber promoted quite a lot of discussion in our office today. Using sugar as a fabrication medium is inspired, but we wondered whether we could use something more accurate than a hot air gun to fuse the sugar. Using a high-power laser would seem ideal, but I think there's a lot of milage in using a lamp (or lightbulb) and a moving lens or mirror to focus heat on a particular area. Networking Today's top tip: Don't slam your network cable between a door and a door frame. You'll end up cutting out a section of damaged cable and assembling it as shown. Although, if I do say so myself, the slight over-exposure makes for quite a nice photo. attic Last weekend I went on a little exploration of my attic. There are two water tanks up there, quite a lot of wooden beams and lots of rockwool insulation. Not all of the rockwool is in the right place, so I've attempted to distribute it properly with a pair of sturdy gloves and a fancy dust mask. Anthony Axford delivered a batch of quarter-boards of chipboard and some aluminium angle which I've used to board up some of my attic. Using the aluminium angle as guide rails I've been able to put down boards to create useful storage space while still allowing me to lift the boards up in case I need to do any electrical work in the future. The south side of the attic already contained quite a lot of wiring which I couldn't cover in case of overheating, but the north side was free of it so I've been able to create quite a lot of useful space there. Happily, a quarter sheet of chipboard is exactly the width of the rafters in my attic. I didn't know that would be the case when I ordered them - it could be a coincidence but it's probably something deeply entrenched in ancient building codes that makes things a multiple of one foot sizes. microsd 2GB!! On that tiny thing? Crazy. In the gallery I've got pictures of that next to an 8MB Playstation memory cartridge, which is about 100 times the volume. If I could find it, I'd have a picture of my 8" floppy disc drive next to it. Kids these days. Honestly. Tsk. I've bought this for my new M3 DS Simply cartridge, which promises to allow me to put some homebrew software onto my Nintendo DS. I was introducted to it by a friend at work who has ScummVM working on his DS using the same cartridge, but I'm mainly interested in writing my own software for it. At the moment though, I have no idea what that entails - I'm led to believe the thing has a couple of ARM processors but apart from that I know nothing. A few weeks ago I thought it'd be a good idea to make myself a bed rather than buying one. After all, I'd get to make one to my exact specifications and it wouldn't look like anything you could buy from Ikea. In addition, I'd made a bed before and it had served me very well. The thing is, when I say 'a few weeks ago' I actually mean 'over a year ago' and I've had the timber cluttering up my front room since then, and simultaneously been opposed to buying a proper bed because I'd already made that small initial investment. Since then other commitments kept appearing, such as fences blowing down and my employers who continually expect me to do the job for which I'm paid. Last weekend I finally finished sawing, chiselling, filing and sanding the components and got the bed assembled, and to be honest it's not that great. My last bed - a bunk bed - creaked quite a bit but I was confident with it because I knew I had enough cross-bracing. The legs on this depend on the quality of the top joints and they're not that accurate, so in engineering terms it's a bit disappointing. Still, it is very solid. I'm mainly glad that all the timber is out of my living room.